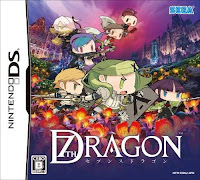 The Gay Gamer: Where art thou, 7th Dragon? Speaking of ignored and overlooked games, where the hell is Sega's retro-rific (I've trademarked that word, by the way) RPG, 7th Dragon? Sadly, Jeremy seems to think the DS title may not make it to our shores. "Sega doesn't want anything to do with it," he mentions at one point, "and I've talked to PR and business development folks at several likely third-party publisher candidates who have all told me the same thing: 'It's too hard.'" Sigh with me, will you?